Need to know more about how to use Turnitin, specifically now that we’re transitioning to Canvas? Here are several training videos that should give you exactly what you need to know. In this broadcast of In Focus: Student Edition, we’re sharing apps, programs and plugins to make your College life better, organized and more successful. Starting Wednesday, November 14, 2018, when students log in to myFSCJ, they’ll be prompted to choose and answer a few easy security questions. Once this is set up, any future password issues will be a breeze to resolve. When the Student tab is selected, students, faculty and staff will be prompted to select and answer three security questions from a dropdown list. Once all three questions are chosen and answered, students will click Save, then will be taken back on the Student tab. After this process is complete, students can easily change or reset their password by clicking the myFSCJ link called Student Help. To reset the password, students will be prompted to answer the security questions they set up. If their answers are correct, they’ll be able to reset their password. As always, if students have trouble resetting their password, or with any other technical issue, the FSCJ IT Service Desk is happy to help. Help tickets can be submitted by visiting help.fscj.edu and selecting Submit a Ticket. Just to clarify, this new system is for student passwords ONLY. While some faculty and staff members do have both staff and student passwords, this system will only work for student IDs and passwords. Staff IDs and passwords will not be affected. As we approach another exciting Fall Semester here at FSCJ, we have some new features for Blackboard rolling in as well! In this post, we'll focus on the features that directly have an impact on you, our students. When submitting assignments, no longer do you have to take those extra steps in browsing for your file. Instead, you can now drag and drop your assignment directly from your computer, including cloud storage services, to the "hot spot" within the Attach Files area. When you drag and drop your assignments, make sure they all have different names or they won't transfer successfully. After a successful submission, the Review Submission History page appears with information about the submitted assignments and a success message with a confirmation number. Students can copy and save this number as proof of their submissions. When students working on group assignments, a receipt is generated for each member, and the anonymous state of an assignment is respected.For assignments with multiple attempts, students receive a different number for each submission. Students will also receive an email with a confirmation number and other details for each submission. To see a history of your past submission receipts, go to My Grades and click on the Submission Receipts link at the bottom of your grade history. We hope you're just as excited as we are for these new improvements! If you have any questions or concerns, feel welcome to reach out to us at edtech@fscj.edu. It’s the day before the test and you’re getting down to the wire in terms of studying. However, you can’t seem to stop making new tabs with YouTube, Netflix or Reddit while staring down Blackboard. These distractions can be troublesome as your limited amount of time is now being eaten away from your studying efficiency. Sometimes you can tell yourselves that a five-minute break isn’t a big deal, but those times can stack up against you once you put all of those breaks together. Instead of taking a bunch of breaks everywhere, why not do bigger chunks of studying without having the temptation to open another tab to distract you? For most people, it’s hard to have that self-control because our minds can run rampant and then you’ll want to go look some piece of information up. Many people who want to become more driven just delete their social media accounts, which is an effective method but it’s also very destructive. There’s a better solution though, an application that doesn’t just block you from popular websites but also helps you with the important skill of moderation. Introducing the Cold Turkey Blocker! A free application that not only helps you moderate your distractions but completely locks you out of any distracting website for the time declared. If you want to pay an additional fee you can block applications and create a schedule as well. Once the timer for Cold Turkey has started, there’s no undo button, you have to wait out the entire duration! Cold Turkey comes with these default web sites blocked, but you can add as many as you need. In case that’s not enough and you need to write a paper, there’s an even better way to block out the distractions. Using the Cold Turkey Writer, which is essentially a notepad that locks you out of everything until the time limit you have set is over. Another option available is that you can’t close the Writer until the word count you set is complete. Although this seems like a lot in terms of preventing distractions, this forced moderation really helps jumpstart the self-control you might need for the upcoming semester! Both of these Cold Turkey apps work great on PC/Mac with Google Chrome, Firefox and Internet Explorer. I can further attest to this as I used both upon writing this article. Check it out! Innovate to Educate is a series created by Educational Technology and Digital Media Productions to share information about innovative technology being used by our amazing faculty at each of our campuses. In this episode, we sit down with Dr. Jeff Smith, Program Manager for the college's Dental Programs, to discuss how he became interested in technology and the ways that the Dental Hygiene Program has used technology, including iBooks and iPads, to encourage student engagement and enhance academic performance. We are happy to announce that Blackboard has released a suite of new, improved mobile apps and that they are now compatible with myFSCJ for Fall 2017 and beyond! Blackboard has split the functionality of the apps to create one that is specifically tailored towards the needs of students and one that is perfect for instructor use! The Blackboard App is the current name for the student-centered version of Blackboard mobile. It replaces the current Blackboard student app, which has been discontinued. It is available in the iOS App Store, in Google Play, and in the Windows Store. Like the previous version of the Blackboard mobile app, students can still take tests, view announcements, post discussions, and review grades with Blackboard App. Now, the app is optimized for mobile, so that the content will adapt to all screen sizes and be more visible and accessible! Users can also upload assignments and attachments from Dropbox, Google Drive, and OneDrive, making it easier than ever to work on the go using just your mobile device. The new homepage for the app also features an activity stream, displaying due dates, posted grades, and assignment uploads for all classes in one continuous, integrated flow. Collaborate is also now fully integrated into the mobile experience, so students do not need to use another app or their browser to join learning sessions on their phone or tablet. The Blackboard app will be continuously updated, with the intent of making it easier and more efficient for students to complete online coursework wherever they are. For more information, visit Blackboard's help site. The Blackboard Instructor app is brand new, and only shows the courses that are being taught, not those that the user is enrolled in. Instructors can use the app to view and send announcements or make courses available for viewing by students. The app is fully responsive and mimics the content layouts and file structure of a Blackboard course within the full LMS. This structure can also be edited or changed from the mobile app. The app contains a student viewer that can help faculty to better understand the student mobile experience while taking tests, watching videos, and reading content. The app will also allow the user to export content for use in other mobile apps or in a web browser. It also incorporates Collaborate access natively, so that sessions can be run completely from the mobile app without relying on a browser or separate plug-in. For more information about the Blackboard Instructor App, visit Blackboard's help site. 1. Ensure you have the correct app downloaded onto your smart-device. 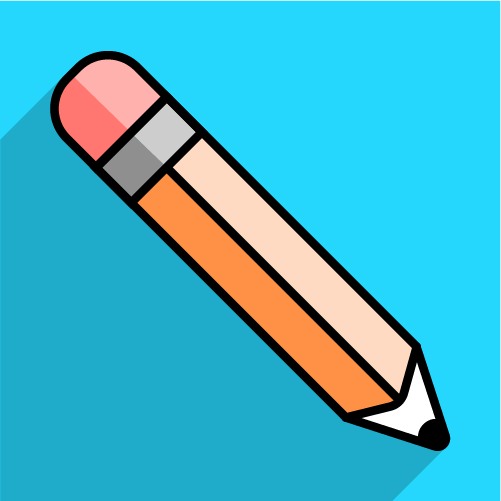 The Blackboard Mobile app’s icon should appear as a blue square with a pencil. (Note: The Blackboard Learn app, which looks like a chalkboard, is not compatible with myFSCJ, so if you only have that app on your device, please download the correct Blackboard Mobile app). 2. Upon opening the app, you will be prompted to enter your college. Type in “Florida State College at Jacksonville”. 3. You will be presented with a prompt telling you to “Web Login”. Click the “Web Login” button. 4. You will be redirected to the myFSCJ login page. Please login using your myFSCJ userID and password. 5. Locate and click the Blackboard link underneath the “Useful Links” section of the student tab. For instructors, locate the Blackboard link within the faculty tab. 6. This will certify your session and take you back to the Blackboard Mobile app interface. If you are experiencing any issues during any one of these steps or with the functionality of the app, please contact the Technical Service Desk at (904) 646-2300, option 3. In the age of Facebook, Instagram, and Snapchat, taking flattering selfies seems like an important life (or even career) skill. Each day, when scrolling through my social feeds, I see well-composed photos of people at the springs, in front of famous monuments, or snuggling with their super adorable pets. I have to admit that this annoys me slightly because I am HORRIBLE at taking selfies. In fact, I sometimes feel like I am the only Millenial who cannot manage to hold my phone out at the right angle and compose my face so I look gently happy and in possession of the right number of chins. Granted, I am kind of an old Millenial, but I refuse to believe that I am as old as I look in my selfies. When discussing this with my coworkers, who are depicted in the lovely images below, I was told that awesome selfie-taking is not some sort of crazy voodoo magic, but rather is a skill that can be learned through practice and the application of a few simple principles, as explained below. Know your Angles It turns out that "your good side" isn't really a myth! Take some time to look at yourself in the mirror (or on your camera's screen) to determine how to hold your face in a way that you think is most flattering. Generally, people who take good selfies are making the same face, at the same angle, in all of their photos. They are not necessarily naturally photogenic, they have just figured out how to work what they have. You have "it", too, you just need to find "it". Camera Placement This is somewhat of a controversial issue. Many people believe that holding the camera out and slightly up can keep you from exhibiting the dreaded five chins. It can also produce odd shadows on your face, though, and it can look a bit forced. Alternatively, holding the camera on the same level as your face, and within two feet of it, can produce a nice look. To keep your face sharp while snapping an image, poke your chin out and down while shoving your shoulders down into your back and away from your ears (remember, beauty is pain). Lighting is Everything Proper lighting can change the look of the planes of your face, the texture of your hair, and the quality of your skin. Natural lighting is best for photography, and especially flattering is the "Golden Hour" around sunrise and sunset. If taking a photo in the middle of the day, try to keep the harsh sun behind you, but use your head as a natural block of the actual sun to avoid overexposure. Avoid fluorescent or harsh lighting at all costs--if taking photos inside, try to find a window or skylight with slightly filtered natural lighting. Background Choice Your background should reflect the purpose of the shot and should be thoughtfully chosen. If you want to document your visit to a fabulous location, focus on making that the focal point of the photo by holding the camera further away from you and experimenting with different viewpoints until you find something that looks interesting. If you just want to show off your outfit or a new haircut, keep background distractions to a minimum. Take a Million Shots Great photos don't happen by accident. Usually, that perfect image seen on your friend's Instagram is just one of twenty slightly different takes on the same subject. The burst feature on your phone's camera can really come in handy here, as it will allow your phone to take a series of photos while you focus on voguing. Try moving the camera up and down, or rotating the phone and your body on an axis. Be experimental! This is supposed to be fun (at least, that's what I hear). When All Else Fails, Filter! Postproduction is always important! Instagram and Snapchat come with tons of built in filters to change the coloring of an image, or to blur it to mask tiny imperfections. I am also a big fan of the Adobe Photoshop Fix mobile app, which allows you to adjust color, fix blemishes, cut out backgrounds, and even use a clone stamp tool to remove tiny distractions. Good luck, happy selfie-ing, and don't forget to smize! Have you ever recieved an email from a reputable source and thought that something was not quite right about it? It may have been a well-disguised phishing scam, designed to trick you into giving up your personal information or email login. Please be advised that there has been a recent rash of scam or phishing emails that appear to be coming from widely used IT services, like Dropbox. Though these emails use logos and branding that make them seem legitimate, they are scams intended to steal email login or other personal information. It is important to always be vigilant when reading emails (at work and at home), and to investigate anything that seems suspicious or unexpected before opening it or clicking on any attachments. Does it address you personally? Spam emails often do not refer to the recipient, or refer to them by email address only. Is the tone urgent and the information incomplete? Since the goal of phishing is to get you to click on a link without thinking, messages are often short with few details, but contain attachments that seem too important to ignore. Who sent the message? Carefully check the email address of the sender. Though it likely will contain the name of the business that is being impersonated, there will be extra information in the domain (For example: Drop-Boxmailing@drop-boxing-authorized.com). Where do the links or buttons lead? Hover, but do not click on any buttons or links within the message to ascertain that they will direct you to a legitimate website. Often, as in the case above, they will direct you to a site that looks legitimate, but has a URL that is too long or contains extraneous information designed to confuse the reader. Does it ask you to enter your email username and password to access the link or attachment? No reputable company would ask you to login with this information. If you receive an email that you suspect may be a scam or phishing, do not open it. Instead, please forward it to the IT department, so that we can investigate and report back to you. Instructions for how to report spam or phishing emails can be found here in our Knowledge Base. 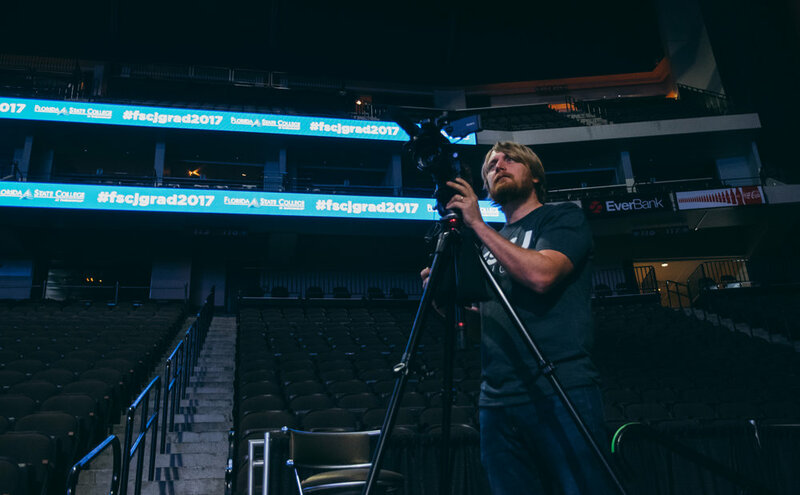 Behind the Scenes of 2017's Commencement Livestream! 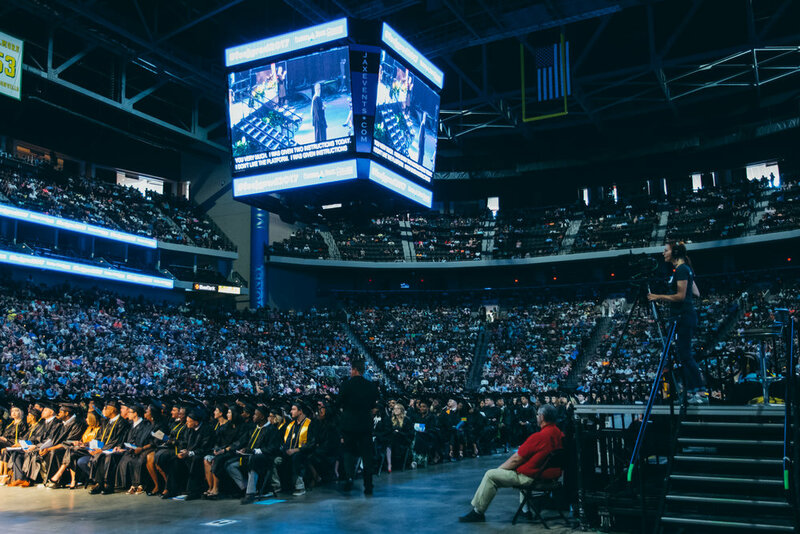 Digital Media Productions (with a little bit of help from Educational Technology) was responsible for live streaming FSCJ's annual Commencement exercises, held at the Veterans' Memorial Arena on May 11, 2017. 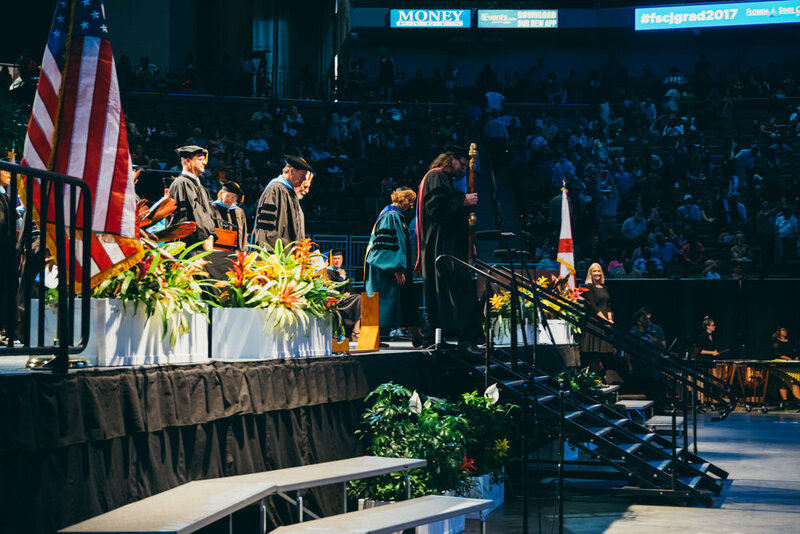 Live streaming enables students' families and support systems to watch the commencement from anywhere in the world via live.fscj.edu or Facebook live. This year's stream was viewed by over 3,500 people in 38 different countries! Live streaming requires the use of ten people, three cameras, several computers, yards of cables, and hours of preparation! View the carousel of images below to get a look behind the scenes at the process of setup and filming. Michael and Mark begin setting up cameras. So many cables to attach and settings to set! Set up began at 9:00 in the morning, in the empty arena. Mark and Curtis work on setting up the main cameras in the center of the arena. 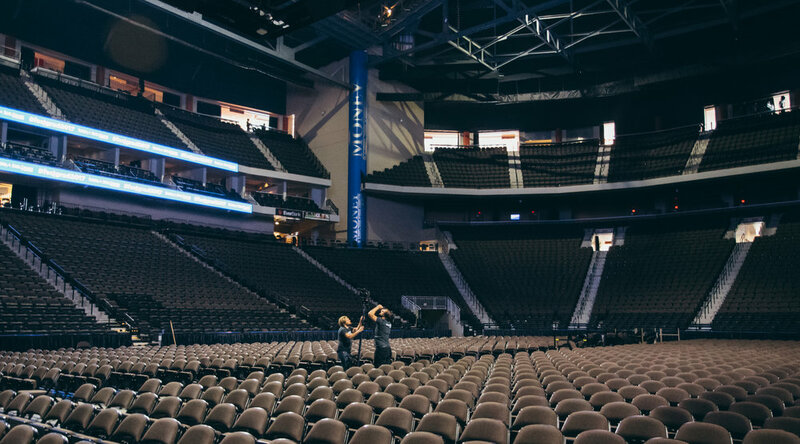 Two cameras in the center of the arena provided most of the footage for the livestream. 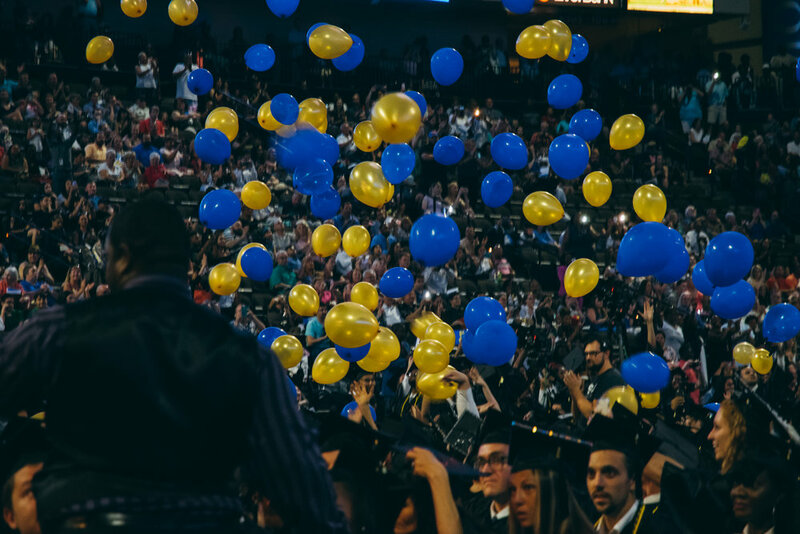 Balloons for the drop are inflated and set into a light net, to be lifted up to the rafters of the arena. Final preparations for the balloon drop. Q: Where did all of those plants come from? A: A vendor brought them all in prior to the ceremony! 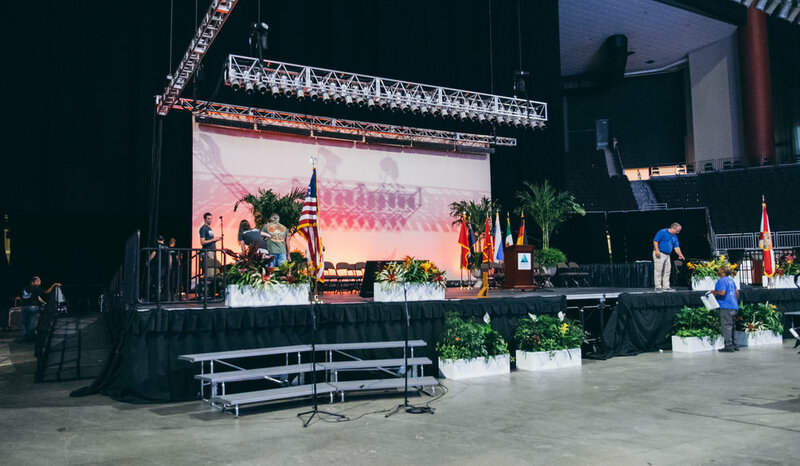 FSCJ technicians set up the entire stage in the morning prior to Commencement. Mark sets up the main camera and does final settings adjustments. Mark at work setting up the right side camera. Cameras feed into a tricaster and computer set up behind and to the right of the stage. Michael manages the view on the jumbotrons and on the livestream. Our camera feeds were displayed on the arena's central jumbotrons. The families and guests begin arriving. On the side camera, Robyn waits for Commencement to begin. On the middle camera, Curtis waits for the graduates to process into the arena. The crew makes final adjustments as the graduates begin to process in! From backstage, Mark views the monitors and directs Curtis and Robyn's camera shots. As Mark directs via the monitors, behind him Amy provides live captions. This is Mark's view of the three camera feeds as he controls which is viewable by the audience. Producer Robin and Engineer Michael listen to the Event Coordinator and provide directions. The graduates begin to enter the arena! As the graduates process in, Curtis and Robyn look for candid shots with Mark's direction. Dr. Bioteau provides an opening message. Student speaker Ms. Medina provides an inspirational message. Robyn films a side shot of Commencement speaker Steve Piscitelli. On the main camera, Curtis films graduates receiving their diplomas. Robyn captures the balloon drop for the live feed and twitter! Dr. Woodward leads the platform guests out of the arena.